Oops. Your child has come home from camp or vacation with head lice! Soon you will discover how many of different head lice treatments are available. But, you may not be aware that the most effective treatment long-term depends on either finding a professional nitpicker or being a good nitpicker yourself. Many lice treatment shampoos and conditioners can kill live lice (or bugs), but they do not kill the nits (or eggs) that cause re-infestation if not completely removed. Lice nits (eggs) can survive every kind of treatment product with unbelievable “stick-to-itiveness” because they are literally stuck with a glue-like adhesive to the hair shaft. Nits will remain viable until they are manually removed (or picked) from the hair shaft. So, the only sure way to ensure a truly effective lice treatment is to call on the services of a professional nitpicker such as those employed by Lice Treatment Center® (LTC). Why Call LTC for a Professional Nitpicker? LTC’s experienced nitpickers will inspect the entire scalp and hair section by section, seeking live lice and nits. If they find any, they will manually remove both live bugs and lice eggs (or nits). Being a nitpicker is not an easy job. Nit picking is tedious, time consuming and requires the patience of a saint with great eyesight! A good nitpicker will take a long time inspecting the scalp looking for lice that have crawled onto the hair from somewhere –another person’s hair, a piece of furniture, shared clothing, hair brushes or some other item used by another infested person. Even though it can be a tedious process, a good nitpicker will make the difference between effective and non- head lice treatment. A good nitpicker will pursue every last nit possible and get rid of all of them. Parents may try to handle an infestation initially but in the end, simply don’t have the time or patience it takes to search every strand of hair and manually remove all the lice and nits. That’s why there are professional nitpickers, like those lice technicians from LTC, who will do that job for them. LTC technicians will do all of the dirty work needed to make sure that all lice and nits are removed. LTC’s professional nitpickers will also recommend the most effective preventive products and practices available to avoid future infestations. Some parents are too horrified to act as a nit picker for their family. Some will even insist on giving boys very short cuts or chopping off a girl’s long hair in order to prevent lice. However, careful nit picking will still be needed on hair of any length to make sure that no tiny, extremely difficult to see nits remain attached to the hair shafts. LTC’s professional nit pickers will arrive at the home equipped with magnifying lights that enable them to spot those tiny residual eggs. Even the best nitpicker may not be able to get every last microscopic nit during the initial treatment, so aftercare treatment by parents is also critical. This involves daily inspecting, oil applications and treatment shampoos and combing with a lice comb must be continued for at least 7-10 following a lice treatment. Check out our lice treatment products and information. 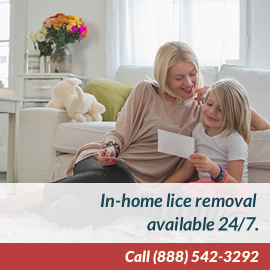 For more information call (888)LICE AWAY/(888)542-3292, or visit licetreatmentcenter.com.